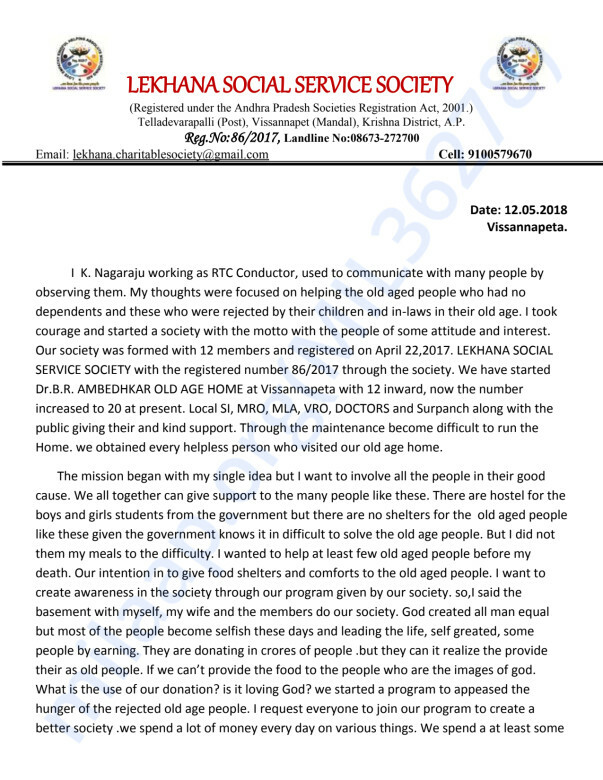 I K. Nagaraju working as RTC Conductor, used to communicate with many people by observing them. My thoughts were focused on helping the old aged people who had no dependents and these who were rejected by their children and in-laws in their old age. I took courage and started a society with the motto with the people of some attitude and interest. Our society was formed with 12 members and registered on April 22,2017. LEKHANA SOCIAL SERVICE SOCIETY with the registered number 86/2017 through the society. We have started Dr.B.R. AMBEDHKAR OLD AGE HOME at Vissannapeta with 12 inward, now the number increased to 20 at present. Local SI, MRO, MLA, VRO, DOCTORS and Surpanch along with the public giving their and kind support. Through the maintenance become difficult to run the Home. we obtained every helpless person who visited our old age home. The mission began with my single idea but I want to involve all the people in their good cause. We all together can give support to the many people like these. There are hostel for the boys and girls students from the government but there are no shelters for the old aged people like these given the government knows it in difficult to solve the old age people. But I did not them my meals to the difficulty. I wanted to help at least few old aged people before my death. Our intention in to give food shelters and comforts to the old aged people. I want to create awareness in the society through our program given by our society. so,I said the basement with myself, my wife and the members do our society. God created all man equal but most of the people become selfish these days and leading the life, self greated, some people by earning. They are donating in crores of people .but they can it realize the provide their as old people. If we can’t provide the food to the people who are the images of god. What is the use of our donation? is it loving God? 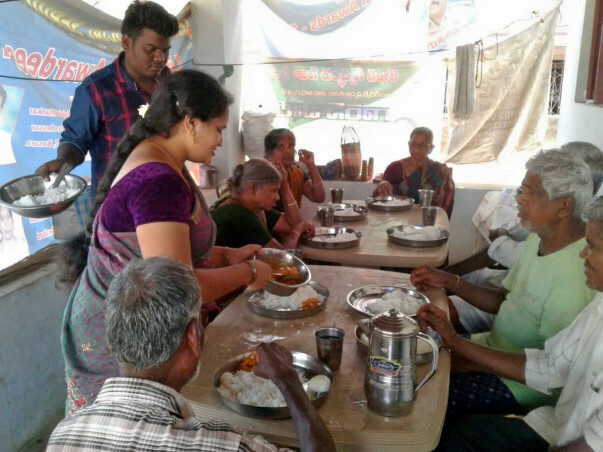 we started a program to appeased the hunger of the rejected old age people. I request everyone to join our program to create a better society .we spend a lot of money every day on various things. We spend a at least some past of our income to the societies like these. If would be a kind help service to human is service to god countries like USA, AUSTRAILA,BRITIAN ,SINGAPURE, SODHI,ARABIA,DUBAI etc… if they come forward in donating at least one dollar a day. We can provide food to the old aged people. Most of the people wasting the food in functions .if they send that to old age homes like ours, you also can help many people. AMBEDHKAR OLD AGE HOME VISSANNAPETA, KRISHNA DISTRICT. ANY ONE HELP ONE AUTO TO TRAVEL OLD AGE PEOPLE TO THE NEAREST HOSPITAL Rs. 2.00 LAKH.